The Blue Crane Quick Field Reference for the Nikon D300 Digital SLR Camera is a general overview of the camera. Covers functions and mechanics. 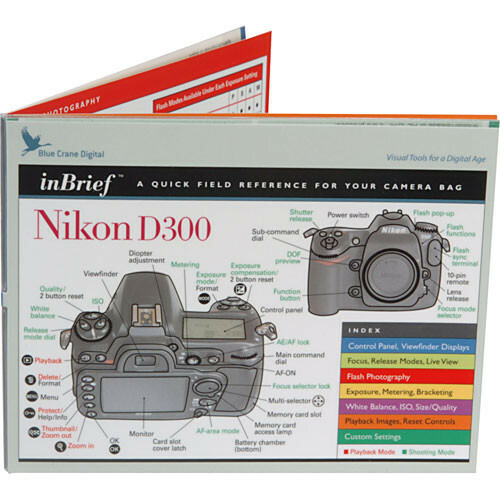 Box Dimensions (LxWxH) 5.65 x 4.35 x 0.05"
Book: Quick Field Reference for the Nikon D300 Digital SLR Camera is rated 3.8 out of 5 by 6. Rated 3 out of 5 by George Ghines from Must Have accessory with room to improve I have the habit of buying the basic literature with every equipment I own. I believe that manuals are there to introduce to the feature of your new equipment but not to fully expand the capabilities. I added this item happily as I had bought in the past another one for my Nikon D40X camera. I got the same good quality and compact information, easy to read. No surprises. Only thing is that the Nikon D300 camera is such a complicated device (you know when you buy), that you should NOT expect this reference card to act as a manual. It is what it says: a reference card only. You must be well-acquainted with the features of your new beast before you can make full use of a reference card. Coming to quality, I still believe that there is room to improve. Better and heavier plastic, better handling of the edges and maybe even better resolution. Even if this comes at a $5 extra cost, someone who has paid a considerable amount for camera body is ready to pay a bit more for a much better quality. Rated 4 out of 5 by Anonymous from Good Stuff A nice, color-coded, quick reference for the D300. Good to keep in the camera bag, just in-case. Rated 5 out of 5 by Patrick from A very good product. Very informative, i am glad i bought ,worth the money. I carry it in my camera bag all the time. Rated 5 out of 5 by Cruise King from The Quick Field Reference is QUICK This is one handy Quick guide. Nikon should include it with the camera.